North Valley Symphonettes (NVS), one of the three youth ensembles under North Valley Symphony Orchestra, is seeking young string players who want to join an orchestra ensemble in January. There is no audition required. Rehearsals begin Jan. 7. Students must have at least one year experience on their instrument, and either participate in their school orchestra program, or take private lessons if their school does not have an orchestra program. NVS meets Mondays from 5:00-6:30 p.m. at North Canyon High School, and is directed by Eily Hallagan. North Valley Symphonettes play two to four concerts each school year. Rehearsals focus on technique, theory, and scales, in addition to learning concert music to provide a robust musical experience. Students interested in joining Symphonettes should contact Mrs. Hallagan at: eilyh@northvalleysymphony.org. Mrs. Hallagan became the Symphonettes director at the beginning of this season, and feels that joining the North Valley Symphonettes is a positive supplemental experience for young orchestra students who are taking private lessons. 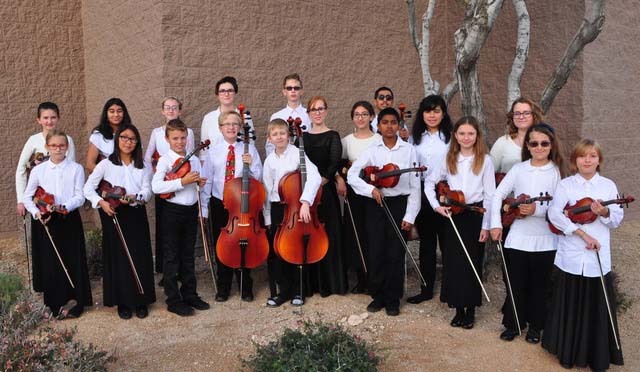 As students progress in their musical training, they are encouraged to audition for the more advanced youth performance groups within the NVSO organization, North Valley Youth Strings or North Valley Youth Orchestra. For more information about any of the NVSO orchestras, visit the website: northvalleysymphony.org.